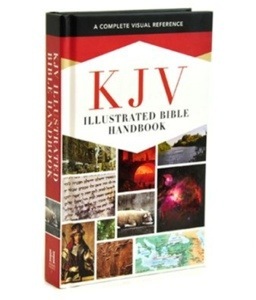 KJV Illustrated Bible Handbook–An Awesome Visual Reference! As a pastor, I have discovered a book here I would love to see all church members have to use in their personal Bible study. There is a chapter on every book of the Bible to give an overview of what you will be reading. Those who are visual learners will find a feast in this attractive volume. This hardback volume by B & H Publishing meets a real need! I congratulate the publishers for having the insight to see what some might call a niche market–KJV users. In light of World Magazine’s recent article stating the KJV was the preferred translation for 55% of Americans (April 5, 2014, pg. 68), perhaps it is more than a niche market after all. In any event, kudos to B & H Publishing. This book not only gives a good overview, but it suggests lines of thought for Bible students. For example, a key text is given for each book. You might not agree with their choice, but that is a great thought process in studying a book of the Bible. Key terms are vital and those are discussed briefly too. Things like purpose and occasion give real insight and the section called “First Pass” launches us into our reading. The section on finding Christ in the book keeps us Gospel focused too. I enjoyed the smaller books of the Bible (we can need extra help on some of the smaller books like those in the Minor Prophets) getting equal time. The section on reliability will be the least useful to many, but they usually come down on the conservative point of view. You might find a point to disagree on here and there, but overall the volume is really solid. There was a statement giving credence to “Q” in the formation of the Synoptic Gospels, but such statements are rare. The maps in the book are taken from Holman maps and they are outstanding and sharp. The selection of photos and charts add real value as well. The claim “a complete visual reference” by the publishers is not an exaggeration. As a bonus, you get two fascinating articles on the KJV. There are interesting ones on the Canon of the OT and the NT respectively as well. Each article is written on a level even beginning Bible students can grasp, but with real detail too. My best recommendation for this book: I am a pastor and I am going to encourage the dear folks I pastor to get this volume and enrich their own personal Bible study. Crown Publications has brought this fine volume back in print. Its claim to fame is that it is the book that changed Lee Roberson’s life. As one of the prominent leaders of the Twentieth Century for Independent Baptists, many are fascinated by this practically lost volume. I actually had one the old copies that was more like a pamphlet. I read it several years ago, but was challenged in reading it again. 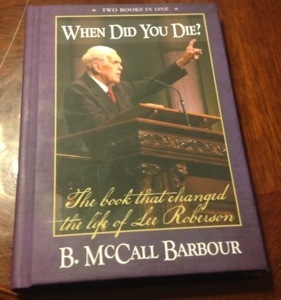 In this lovely reprint, you actually get a bonus volume entitled “How To Die Daily”, also by B. McCall Barbour. An introductory chapter on Lee Roberson along with the volume’s appealing look makes this a fine addition to any library. There has been some debate in recent years over the theology of these type writings. Particularly the phrase “let go and let God” has been under scrutiny (The phrase was mentioned in this volume). Some have thought to say “let God” implies giving God permission! But in this context it is about what you and I are going to do, not what the Lord may do. Half way through my reading of this book, I did an online search and came across R. C. Sproul’s website that had an article on this phrase and theology. He raised a few points worthy of consideration. Some taught it as the “second blessing” and that is actually more than the Bible teaches. To make it all about one exact point in time rather than an ongoing process of sanctification is a mistake. If you remember that it is still a process, though with possible great breakthroughs, this volume will enrich your spiritual life. I see Mr. Sproul’s point to some degree (he seemed most concerned, sadly, only about adherence to confessional reformed theology), but no doubt there are special seasons of God’s dealings too. When that happens your self life is going to take some blows! Don’t be lulled into thinking you have crossed a threshold and now are safe, or beyond certain things. You could hardly be in a more dangerous place. Be cautious about thinking you are in the advanced Christian group–that is not the point of dying to self. This is not a short cut to spirituality, but the real business of the Christian life. The idea of reckoning what Christ has done has sure helped me in some problem areas in my life. You will be helped by this volume’s discussion of that subject. No matter what anyone wants to criticize theologically, the subject of the self life fills many pages in the New Testament. It is worthy of our attention and revolutionary to our spiritual lives. You can find this volume here. 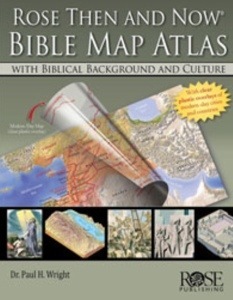 Would you like a fine Bible Atlas written by someone who has been immersed in the lands of the Bible? Then the Rose Then and Now Bible Atlas is a great option for you. Substantial at 272 pages, yet accessible even for newer Bible students, we have a real asset here. Perhaps you saw the earlier Rose Then and Now Bible Maps. I always felt it was more of a Sunday School item than one for the serious Bible student, though the modern overlays are a brilliant idea. Frankly, there were just too few of them and I would have preferred a different scale at times. There are about the same number of overlays, but we have a fine atlas too. Really, the overlays are just a nice addition to the atlas itself. What we have now is Rose Publishing joining the big boys in the atlas world. What is unique to this volume among the atlases out there is the historical detail given. Paul Wright does a great job of relating the biblical narrative as he progresses incorporating well the geographic details. The history begins with the Patriarchs. There is no mention of Adam or Genesis 1-11, pro or con. My guess is that there is little real geographic knowledge of those times. Still, Scripture pervades the volume. In the chapter on Jesus, He is described as God in human form. The entire atlas takes a historical approach. There are no sections on parts of the Bible like, say, the Minor Prophets. Their time period is covered in the historical flow, just not the books themselves. Most atlases take the other approach, but I am glad to have one from this distinct vantage point. The maps themselves are from Carta, which is the gold standard of Bible maps. The pictures are satisfactory and the maps plentiful enough to go along with a rich text. Most people just try to get one quality Bible Atlas. This volume is a contender for the Bible Student. Church membership is suffering in our day. The selfishness of our times has been a corrupting influence. We see church as something that should meet our needs rather than a place to serve Christ and others. Now church, in so many cases, falls below the model presented in the New Testament. 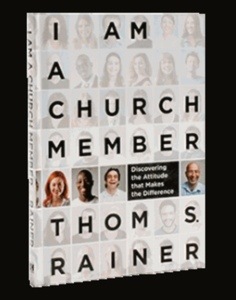 Enter the tonic of I Am A Church Member by Thom S. Rainer and published by B&H Books. In 6 short, really helpful chapters, he brings us back to reality on the matter of what it really means to be a church member. He shows us New Testament reality versus country club mentality. We want to get something out of our church membership, but we can only get it in serving and functioning as a real member. It is not getting taken care of, but taking care of others. He hits on the critically important issue of actively pursuing unity in the church. Can you imagine the benefits of unity if we all made this our job? He explains how we degenerate into making church just be about my preferences and desires. How many churches have died this very way? I would love to see this book in the hands of every church member. ( Look for $5 deals). It is good, yet short enough that those who don’t particularly enjoy reading can get through it easily. There is a pledge to sign at the end of each chapter that makes you wrestle with these issues. We had better do something as church membership is in such decline. Some men really won’t like this discussion, but I assure you many women in the Independent Baptist world could tell you a thing or two. They know something isn’t right and face incredible pressure to not say anything, nor even think about it. They are quieter than those in many other groups, but they are thinking about it. I know. Too many of them have written my wife and I. Now, let’s have no misunderstanding. The Bible is clear that men and women have different roles in the home and church. That difference implies no difference in worth the Bible makes equally clear. Like many fine Christians, including some reputable scholars, I am a complementarian. That position retains “wives submit” while strongly emphasizing “husbands love”. So it is not the egalitarian position that takes the verse Galatians 2:28 that says that in Christ “there is neither male nor female” to mean that Ephesians 5, Colossians 3, and I Peter 3 are not binding. Both sides there are true of course, but while it is true, some have used it as a cover for abuse. It is one thing to speak of the man being responsible for a spiritual leadership, yet it is quite another to say he gets to call every shot. That he gets to demand an obedience from his wife equal to what his children must give is over the top. That setup between adults means he gets to spiritualize his natural selfishness. Selfishness is something in our flesh we must all deal with, but it is sure to warp when we can claim to the one we are imposing our selfishness on that God expects it of them. I wish I could say I have never played that card in my marriage, but I won’t defend instances of doing it. Let’s be real, the need of spiritual leadership is probably less than 5% of the issues that a Christian husband and wife disagree on. That means 95% of the time we should work it out with the give and take that is normal between adults. When our pulpits exaggerate this biblical truth beyond its actual meaning, people are hurt. I have seen many pastors create an environment where women were second class. Beyond the true role difference ( like they may not be a pastor of deacon), they are presented as intellectually inferior. That is absurd and without a shred of biblical evidence. Some of these pastors not only run women down, they actually abuse them. Have you ever seen a pastor’s wife with ever downcast eyes? Often this is the reason. Some husbands might even do better if they weren’t told they were a spiritual wimp if they can’t lead their wife around like a puppy on a leash! Some pastors abuse women further by not only giving husbands a license and encouragement to mistreat their wives, they in turn hold themselves up as am authority to the women as well. When the pastor and husband are not in agreement, the wife is in an ugly catch 22. In my last article, I referenced Bill Gothard, who is now embroiled in scandal. He had incredible influence on pastors, even among Independent Baptists, who are now in their 50s and 60s. He taught a “chain of command” that goes beyond what the Bible actually says. He has a diagram that has an umbrella of protection where if the wife is under the husband then no matter what he does, or she made by him, will fall on her and she will be protected by God. Children are in the diagram under the wife. This is a gross misrepresentation of Scripture as it violates the clear mandate for the priesthood of every individual before God. This is a flawed model wreaking havoc on homes. It can run in a negative way through our churches too. That teaching even puts single women under their fathers no matter their age. There are 40 year-old women out there that can’t do the simplest things without Daddy’s permission. As wild as this sounds, we have several churches and pastors in our movement that teach this system of belief. It should stop! It reminds of the Pharisees. Pharisees would often testify of what the were especially thankful for. They were so thankful they were not a Gentile. That is a little superior, isn’t it? Do you want to know another one? They were glad they were not a women! 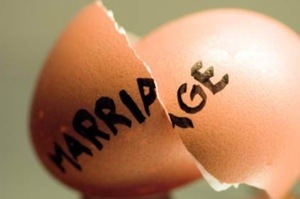 They used women and changed the reasons for divorce time and again. Here, as in many other ways, I say it is time we stop following them! Have you heard the tragic stories that came to light in the last few months? The first one involved Doug Phillips, president of Vision Forum. He was a legend in the homeschool movement and had a ministry that encouraged Christians in their family life. He went a little farther than some could agree with in his position that came to be called patriarchy. Still, he had a lovely family himself, he put out the most amazing catalog of family books and toys imaginable (my children and I loved it), and he was very influential. In November it came out that he had some sort of inappropriate relationship with the nanny he hired to help his wife. The 2014 Vision Forum catalog was printed, but never mailed. Vision Forum ceased to exist on December 31, 2013. (News article). The other case involved Bill Gothard. He has been around since the 1970s with his writings and seminars. He had an incredibly wide ranging influence that included a certain generation among Independent Baptists (I will write on that later). Now over 70 years old, he is enveloped in scandal. Strangely, he has never been married or had children himself, but he has been accused by numerous young ladies of harassment and inappropriate touching. He has been removed from the presidency of the organization he founded. (News link). Does that make you angry? Are you right now saying to yourself, glad they were dealt with? Most feel that way. What should Independent Baptists learn from these scandals? (Neither of these men were Independent Baptists). There are two great lessons really. First, we shouldn’t wax too eloquent as we too are but sinners capable of falling into any sin ourselves. I pray the Lord will pour His grace into the lives of the victims and perpetrators alike. We have all sinned, but we must admit that some situations reach a level that they must be confronted. These two situations obviously reached that level. On the other hand, we have a reputation for being so hard on some. We have some ugly cases of broken confidentiality and public humiliation for some rather small infractions in some of our churches. Then there are the instances where that harsh standard is not consistently enforced. We have run some people forever out our doors over this unscriptural behavior. Second, we must hold our own pastors and leaders accountable. I do not mean nitpick and be harsh on pastors. We pastors are but feeble sinners ourselves, but I mean deal with these major scandals including pastoral abuse. Since we are ready to lay the head of Doug Phillips or Bill Gothard on the chopping block, then why do we not hold our own to the same standard? Why would we ostracize one of our own if they fellowshipped with the wrong ministry while we look the other way if they have a real scandal or are guilty of abusing one of their sheep like the worst of hirelings. Some pastors (an embarrassing, vocal minority) abuse their authority, that God intended to be limited and specific, by using “touch not mine anointed” beyond its legitimate usage. They make questioning of them, even in regards to actual sin and scandal, a sin when it fact the sin is theirs. Some church members have unfairly thrown out the label “dictator” on a pastor who only took a godly stand, but the fact remains there are some dictators out there. The worst damage of this behavior shows up when scandal rears its ugly head. The sin deepens while pastors hide behind the misshapen shield of pastoral authority. The reality is that every authority has its limits under God for which the authority will answer to God. Every person under authority has a right under God to seek accountability for those in authority. That is why so many of us have something to say about our President in these days. The authority may not respond appropriately, but the Lord has written justice into the fabric of His creation. For an outrageous example, I have read documented reports of a church where the assistant pastor/ pastor’s son had set up a secret camera and photographed young ladies changing their clothes years before. The videotapes were found and ended up in the hands of the police. The evidence was overwhelming but the sheriff said it had just past the statute of limitations. The news media made a big deal of it and it was known widely. What did the pastor do when church members approached him about this issue? He churched or excommunicated them and publicly ridiculed them to the congregation. This is a scandal itself! Sadly, some make these type situations worse. In this example, some well known Independent Baptist leaders hold conferences at this church and hold it up as a model church. The bewildering part is that these same leaders have separated from so many other Independent Baptist pastors over personal standards, music, or personal associations. Is this insanity or what? 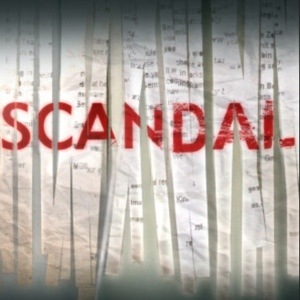 We should not relish scandal. We should be heartbroken about it. I consistently in this series try not to mention names of the Independent Baptists I am writing about from an issues standpoint. (Mr. Phillips and Mr. Gothard will never read this blog nor will those in their circles). Scandal will hit every group in Christianity. History proves it and the nature of sin guarantees it. Our scandals do not write us off, but how we deal with them very well could. We have here a book that purports to “lay the groundwork for perspectives…that raise important questions concerning religion, Scripture and even our Creator.” The book no doubt raises several questions, though I am not satisfied with all the answers. 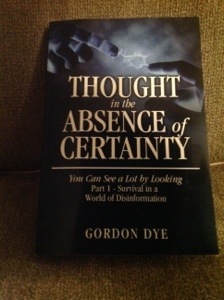 It seems the author, Mr. Gordon Dye, felt he could help make God plausible from a philosophic point of view. Perhaps he did that much, but the human heart needs more. On the plus side, he explained many terms of philosophy and rhetoric well as he tried to stick to principles of logic. On that level he succeeded. It had a textbook feel to it, but it could serve as either an introduction or as a refresher. On the negative side, the writing was dull. Mr. Dye is obviously a brilliant man, but his style of writing did not match that of his understanding of complex issues. He lacked passion as he worked so hard to explain. He too often filled pages with meta discourse as he spent too much time telling us what he was going to write about instead of just writing about it. He also tried to harmonize God and science where believers like some of us need no harmonization. In fact, for a sincere believer he would seem to be raising doubts. Perhaps he would be help to an agnostic, but his conclusions are too weak to really draw someone to God. His case never gets beyond a theistic conclusion. He can only get us to god, whomever He or She may be. The book, then, would be of no more value to a Christian than, say, a Muslim. He says he was raised by ordained Evangelical Christians and that he got beyond their thought system without “rejecting his faith.” I will not propose to speak for him, but his faith made no mention of Christ. He did not preclude Christ necessarily, but He was at best lumped with all the options for God in this world. The Christian faith says you cannot reach God other than through Jesus Christ! So the book has, in my, perhaps, biased opinion, a fatal flaw. You could argue that this is a work of philosophy, not Christian apologetics. In truth philosophy has often been an esoteric pursuit that could only raise brilliant questions that it could never quite answer. It found its readers among those with enough leisure to think long and slow. I mean slow because we could never get where we were going. The common people found little time for it because their lives throbbed with emptiness that needed filling and their hearts craved real answers. That is why apologetic works are so superior to philosophic ones, and Christ so superior to all those other gods Mr. Dye gave credence to. For example, if his logic proves the verbal inspiration for other religious books as much as the Bible (chapter 6), then it proves nothing at all. Again, Mr. Dye is intelligent, but I can’t really recommend this book. When the Apostles turned to their Bible, what was it for them? 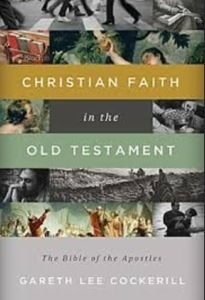 In clear, accessible style, Gareth Lee Cockerill shows us that it is what we call the Old Testament. More than that, he rescues the Old Testament from the oblivion that some would banish it to. He discusses it with gusto because he believes it is critical for Christians today. Unlike many scholars, he follows what the New Testament told Christians to do with the Old Testament–1 Corinthians 10:11 “Now all these things happened unto them for ensamples: and they are written for our admonition, upon whom the ends of the world are come.“–that is, mine its pages for great spiritual treasure! Thank you Mr. Cockerill. This book succeeds on every level. It accomplishes its goal of reigniting passion for the Old Testament. In reading it you get a good overview or even an Old Testament survey. Even better, you get it without the dryness that some scholars are ever handicapped to write with. As a substantial bonus, and what separates this book from many competitors, there is real application for the Bible student or pastor scattered all along the way. The Charts added real value as well. They actually taught something. I was particularly blessed as seeing the parts and the whole in a better way. The Appendix on “Why are these books in our Old Testament?” was exceptional. With all the critical questions on the Canon being thrown around today, I can hardly think of a more succinct presentation. He lands where many of us believe. In a small compass you really got the help you need. I enjoyed reading this volume straight through, now it will find its way onto my shelves for reference when I begin study of a new book. Such books have always proven a great boon to me. I read this book thinking I wish more scholars wrote this way. On every page I felt that Mr. Cockerill believes– he really believes! That is more of a problem in the scholarly world than some realize. I know he is a respected scholar because he has recently released a major commentary on Hebrews (that makes sense) in the prestigious NICNT series. I want to get that book now too. A+ all the way here. I recommend it for Bible teachers and pastors, but studious layman can handle it too. Master this volume’s contents and a better Bible understanding you will have. My husband asked me to guest blog for him this week. I asked him why and he told me that he wanted a woman’s perspective of the Independent Baptist movement. Since I grew up in this movement, and have been in the ministry my whole life (my dad was a pastor) then I guess I am qualified to give a woman’s perspective. Much of my thoughts have been in my head for many years, but as my children are getting older my thoughts have become much more serious to me. What am I teaching my children? Jimmy and I have been burdened for some time with the rut that much of our movement seems to have settled into over the years. We see our generation leaving our movement and the preaching then says, “Well, that is what happens when this generation wants the things of the world and gets more liberal”. We argue that complacency and stubbornness to stick with tradition are just as wrong a heart as a heart that is leaving to find a more comfortable place to worship The Lord. We also argue that many of our generation are leaving BECAUSE of a hunger for righteousness…not in spite of it. If this is the case, and we believe that it is, then something drastic must happen in our movement if it is to be rescued. I am a mother. I think of what we are passing on to our children. My questions are from deep within. What am I offering my children in this movement? A system? A religion? A list to check off in their lives to be accepted? Will they be raised in a church to grow up and leave it because it has disappointed them? Will we follow certain leaders so much that if they were to fall into sin my children would be disillusioned and doubt God? Am I feeding them a philosophy of works based sanctification that gives them the idea that if they can keep it they somehow will be a little more favored of God, for them to grow up and know it is impossible and then always feel that God is disappointed in them? These are questions that have processed in my soul. There are many wonderful Independent Baptist churches still out there. But there are also many that are not. It is for these members that Jimmy writes. It is for these mothers that I write. It is for our children and the next generation. There has to be some shifting in the thoughts of many of our churches or our children, if they desire to know the Lord, may very well walk away. They already are. Jimmy and I see a shift in our movement. We still see a future and we don’t want to walk away (although we have been tempted). Instead, we want it to return to its roots. A movement that originally simply pulled away from a big brother system that tried to tell other people what they must believe and support as a whole even against what they personally believed. We have turned into the big brother system and we believe that God is working in a generation that is once again saying that we will not ignore our personal accountability before God. We feel we are part of a generation that is taking it back to what it once was, and what it should be again. I am thankful for my goodly heritage, but a heritage is not what I want to pass down to my children. I want to give them Jesus. I don’t want them to know about God. I want them to know God. I don’t want to teach them to just ask Jesus into their hearts. I want them to learn to have His heart. I don’t want them to live like Jesus. I want them to learn to get out of the way and let Jesus live through them. I don’t want them to act friendly. I want them to be a true friend. I don’t want them to work for God. I want God to work on them. I don’t want them to be held captive by the law. I want them to be captivated by the love of Jesus. I don’t want them to just preach the Gospel. I want them to live it. I don’t want to teach them to influence people. I want to teach them to show others how to be influenced by Christ. I don’t want them to walk an old path. I want them to walk with the Ancient of Days! I don’t want them to have the old time religion. I want them to have a fresh relationship every single day with Jesus. I don’t want them to just attend church. I want them to be a example of what being a part of the church…a living organism…should be to others. I don’t want them to do the right kind of things. I want them to be the right kind of person. I don’t want to groom them to be spiritual leaders. I want them to learn that the only way to be spiritual is to be a follower of Christ. I don’t want them to ever think that they have arrived, or that their parents have arrived. I want them to know that we are all on a journey that constantly changes and we all have much to learn until the day we die. I don’t want them to ever think they can earn Gods favor. I want them to know that none of us can, but He graciously bestows it on us because He loves us. I don’t want them to think they can do right. It is not in our flesh to do right. I want them to learn that if God dwells in them, it is only His goodness that will come through us, and that is why we need Him so in our lives. I have hope for my children! I pray that they will desire to be real with God and to seek His Word for their lives. I pray that they will first see that in my life! I pray that by the time they grow up, they will be a part of the generation that has gotten back to Gods Word as the guidance of their lives. All articles in the series here. 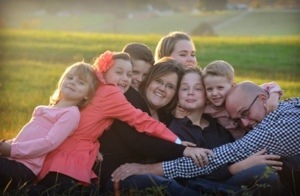 Check out my wife’s wonderful blog where she simply writes her heart. 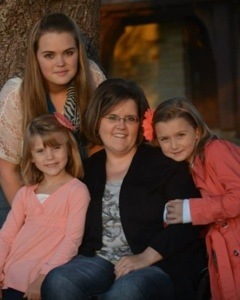 She shares life as a wife, mother, pastor’s wife, and paraplegic. I love her! She is my partner in crime! Check out her articles to help the disabled too!